Spectre’s High Performance Push-In Breather was designed for valve covers with a 1-1/4 inch breather hole. 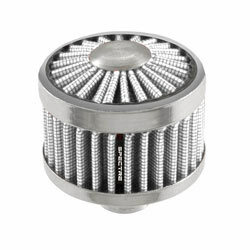 With a triple chrome-plated steel top and base and an overall height of 2-3/4 inches, this breather features a 2 inch tall Extraflow filter element made from our white synthetic fiber filter media. Manufactured using high quality materials and designed for a universal fit. Note: Legal in California only for racing vehicles which may never be used, registered, or licensed for use upon a highway. See spectreperformance.com for CARB status on each part for a specific vehicle.